After riding the seemingly endless summer rays over the Suisse mountains last summer, this time it was time for North. And by North I mean that charming little country with far more to offer than it meets the eye (or the superficial general knowledge): the Netherlands. So, one lovely August afternoon and thousands of kilometers away from Bosnia, I finally found myself on the Utrecht train station, waiting for a dear friend to pick me up. First stop: Zeist, a municipality about 15 minutes from Utrecht, and his house where I immediately felt at home. One of the reasons is that we share the same profession, so upon seeing the plaque (featured at the end), I just had to laugh, thinking my colleagues back in school would definitely appreciate it, hence the photo. The rest of the afternoon and evening I spent relaxing and drinking in the Dutch way of life, which is an enjoyment. Far less pressure, not overthinking anything, not being hung up on the war subject – all just some of the traits we could all use here in B&H. Tomorrow was reserved for Utrecht and one of his most important landmarks – the Dom Tower. 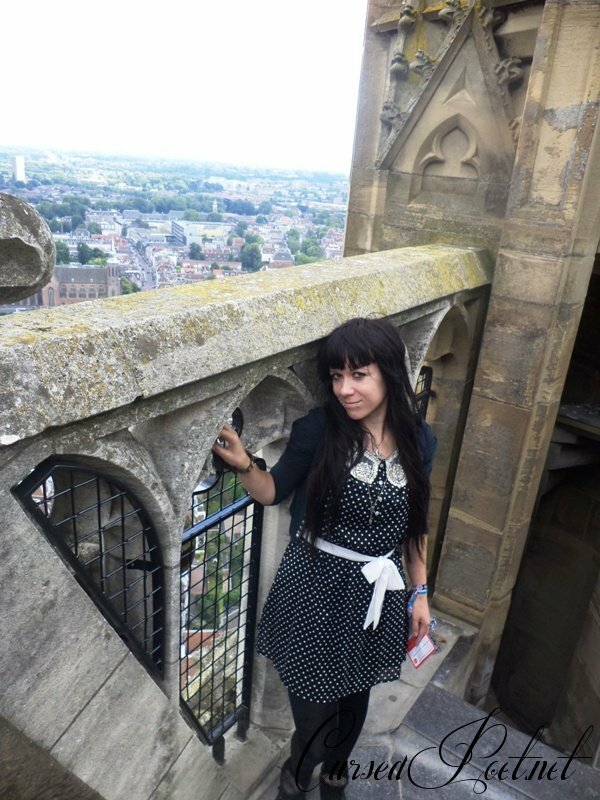 This gothic beauty was built in the 14th century and attracts a number of visitors each hour for a tour all the way to the top. Even though the tour was in Dutch, my friend got another role – that of a personal translater to me, so it was all good. The stairs were steep and numerous, but we got to the top soon enough and enjoyed the view which reached Rotterdam on one side and Amsterdam on the other. How strange and amazing it was to see such a broad horizon, without a mountain or even a hill in the way! I knew I was going to like the Netherlands as soon as I saw apartment buildings with balconies above canals when I was travelling in the train, and this proved the feeling to be true. Utrecht is truly one of the most beautiful cities I’ve ever been to and definitely worth visiting! Back in Zeist we made sudden cool plans to go to Rotterdam in the evening to catch Death Angel on their last concert of the tour and it seemed as I didn’t even have time to turn around, and it was already time to move! The trips to and from the city were an experience in their own right (what with loud singing and laughing with a bunch of Dutch guys in the car), and the gig was awesome as well (report for Venia right here, my dear readers). We enjoyed the earliest metal gig ever and came back home to Zeist just in time to kick off the evening with a YouTube request party and my attempts at learning Dutch fast. Monday was D day, as my friend took me to De Haar, a castle near Haarzuilens (still in the province of Utrecht). They say a picture is worth a thousand words, so my gallery is now filled with plenty of photos to adequately convey the magnificence of this estate. And still, it’s still elusive to the human mind somehow. This time, the tour had an English translation printed out, so I was able to laugh and marvel at all the right moments (as the guide told us about the time Roger Moore had dinner in the hall or Gregory Peck spending the night in the Baron’s Room). Sadly, we couldn’t take photos inside, however, the outside offered as much to look at as the interior. The Roman Garden, the Rose Garden, the lake à la Versailles. One could spent a whole day just looking at the castle from all the angles, its wooden gate, the dreamlike position in the middle of water, the sculptures guarding the front entrance. The evening after the castle was reserved for the Light Route in Utrecht, better known as Trajectum Lumen. Another brilliant idea of the Dutch tourist workers was to put little guiding lights in the cobbled streets of the city, which are lit by night and show the route to the various sights, such as churches, canals and other architectural creations surprisingly alluring at night. We were followed by a curious cat in the middle of the tour, much to my delight. As Utrecht is a student city, the street cafés were filled with adolescents laughing and finding their own place in the world, which made us reminiscent of our faculty days, gone, but not so long ago. A sigh and some hours later, we went on a rain-filled trip to Düsseldorf, to spend the afternoon there and catch the plane back to Vienna. Four days I spent in the Netherlands filled up my batteries to the brim and I went back with an awakened love for this land and the Dutch way of life. Special thanks to the host, my dear friend Peter, as well as his roomates/friends Rutger, Bart and Sander for a wonderful time in Zeist, including vegan pancakes and special renderings of famous local songs!